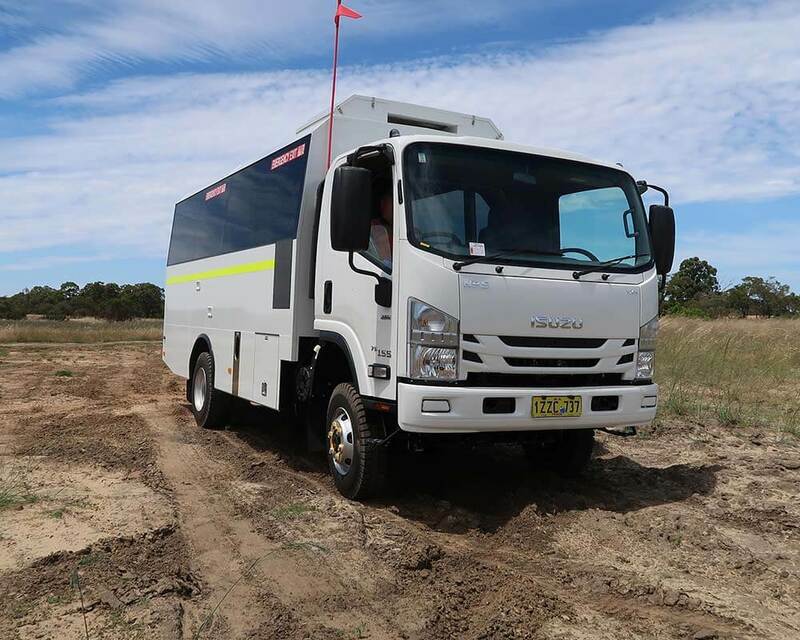 Omnibus Services recently delivered four Mining personnel transfer vehicles to a WA Gold Mine site where they will go into operation transferring workers from camp direct to site without the need of transferring into smaller 4×4 vehicles for the decent into the pit. The vehicles are equipped with what is normally associated with Tourism Coach applications including Heat/Cool Coach Air-conditioning, pneumatically operated passenger entry / exit door operated from the drivers position, with heavy duty auto step to bridge the gap between the high riding 4×4 platform to safely enter and exit the vehicle. A camera above the passenger entry door offers the driver a clear view when loading and unloading. Based on the proven Isuzu FTS800 Cab Chassis with rear airbag suspension offering a more comfortable ride in rough conditions compared to the traditional leaf spring configuration. The “T” Series body seats up to 34 passengers in comfort with a variety of interior configurations to suit any mining operation, the interior has been designed with no surface where traditional cloth trim has been used which collects dust and is harder to clean. With its Coach like appearance the Omnibus “T” Series 4×4 would be as home in Tourism operations yet built to survive the harshest mining environments, with full lift up skirt panels the underside is easily accessed for cleaning and maintenance. A large access tunnel from cab to body allows communication between driver and passengers and being easily disconnected not hindering any service checks or maintenance access. Built locally in Perth Western Australia using all locally supplied product ensures the ongoing repairs and maintenance do not become an issue and vehicle downtime is minimised. Contact Omnibus Services on 9256 3211 for any further information and pricing, whether it’s a small 4×4 or large we have a “T” Series body to suit most chassis types.